Poker is about trusting the odds; but what if your whole life was at stake? Matt Gallagher finds himself in Toronto's illegal poker clubs every night. They are a world fuelled by addiction and one-upmanship. The wild characters who inhabit it live for the high-intensity risks. Matt, out-of-work and with a new baby and wife to support, must put everything he has on the line to bring home the daily bread. But as the stakes rise ever higher, Matt soon discovers that the real meaning of risk lies far beyond the poker room. The cards flick quickly across the table. Danny nonchalantly takes a look. It's a pair of kings. The odds say it's time to go all in. But across the table a pair of aces are turned over. Anything but another king and he's out. Danny jumps up from the table, unable to take the tension. First a three, a seven and then a six...it looks all over. His hands clench the back of his chair as the players wait for the last card. It's a king and Danny leaps into the air. "That was ridiculous! I'll take it though, I'll take it." 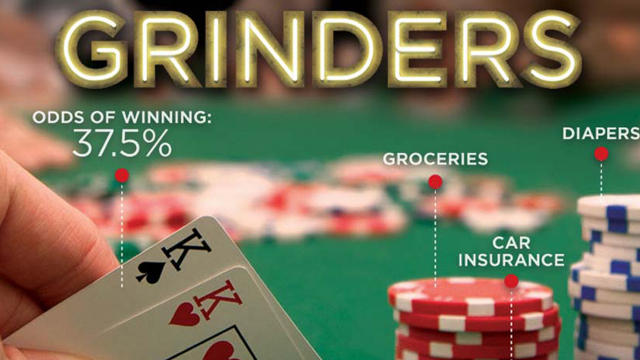 For the 'grinders', the guys in these underground clubs, poker isn't just a game, it's a lifestyle. "If you want to be a degenerate, if you want to be a grinder, you just gotta play poker non-stop." 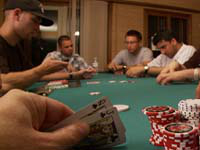 The stakes follow them out of the poker room and into their lives: "you are playing poker for a source of income. If you lose you don't have enough for milk or cheese; you're screwed", Andre tells us. Matt feels that pressure even more. His wife doesn't like the late nights and unreliable income. "Now, with a second baby on the way, I'm feeling even more pressure to do well at the tables". But none of this can show in the game. Sitting across from Andre he has to keep it all under wraps, even when he sees the chance to make a lot of money. Show too much and Andre will fold. "What a beautiful turn for you! ", Andre roars when Matt finally reveals his hand. For many, playing poker is more than making a living, it is a burning obsession. Danny has been in rehab for a gambling addiction. Now he is just trying to play for his family; a 'low stakes player', as he calls it. But it's not always that easy to draw the line. After eight hours at the casino Danny is back in his room gambling online. "This is getting me ready for Vegas", he says. "I'm gonna be totally peaked if I get a piece." For the first time ever, Grinders pushes past the conventional curtain of mainstream gambling, bringing the camera right inside the underground circuit and into the lives of those chasing the elusive - and often destructive - dream. Its intimate narrative comes face to face with the true meaning of life, chance, fatherhood...and the secret art of poker. Border City Pictures was established in 2004 by award-winning director Matt Gallagher and award-winning producer Cornelia Principe. With decades of documentary directing and producing experience between them, Grinders, which screened to sold-out crowds at Hot Docs 2011, is their second feature together. 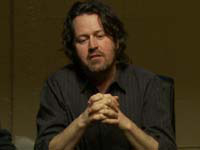 Their first feature-length documentary, The Rise and Fall of the Grumpy Burger was called "tailor-made for cult status" and had its festival premiere at Hot Docs 2008, its broadcast premiere on TVOntario and a theatrical run at Cinematheque Ontario.